Shaw was called up from his London office job in 1943. 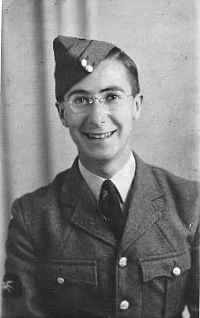 He volunteered for the RAF but his dreams of becoming a Spitfire pilot were dashed when it was pointed out that he was short sighted and wore glasses! It was deemed that he should become an RDF operator and he received training for this at Cranwell - but not as an officer cadet at the RAF College. His first posting was to Ventnor where he was billeted out at a house in St. Boniface Road. He had to walk each day to the Down Lane lorry pick-up point and he made sure not to be late as then his walk would have changed into the "mountain climb" up the side of Boniface Down to reach the top site. Shaw worked as an AC2 operator on the Chain Home Low (CHL) equipment which was essential as CH was not low looking at all. He recalls in late June and July plotting the flying bombs aimed at Southampton and Portsmouth, many of which passed directly above the site. In his words "Carrying a 1000lb warhead they flew on a consistent bearing at 400 mph and approximately at 1000 feet, and as Boniface Down is 750 feet above sea level and the steel masts carrying the CH curtain aerials rose another 360 feet it doesn't take much working out that they were ready made 'fishing nets' for any bomb that flew between them! What was worse was watching the PPI tube that showed the bomb coming straight for you before it became lost in the last three miles of the ground returns. There was a shouted four letter code word which translated into "Get under the table quick!" On one occasion, although Shaw tried to dissuade him, a visiting civilian scientist insisted on forgoing the safety of the Ops. Block to see the flying bomb currently being plotted pass overhead. Shaw, feeling responsibility for his welfare, grabbed a couple of tin hats and joined him. The 'plot' had become lost in the ground returns and as they waited outside they could hear it coming and when it suddenly appeared it was about thirty feet above their heads as with characteristic pulsating rasping drone and belching flame it vanished to the north missing the 'fishing nets' by no more than a few feet. During those months six doodlebugs exploded on the Island, one as close to the radar site as Lake, and several more were shot down into the sea. This same scientist, Dr. Varley, had been on site several weeks earlier to test an enemy radar detecting device and had co-opted Shaw to assist. The machine consisted of a rotating cabin mounted on a trailer with a box of kit and a pair of microwave type dish aerials bolted to the side. Shaw's job was to wind handles that caused the the whole cabin to sweep back and forth in the direction of France. If a blip appeared on the CRT it could be caused by an enemy radar transmission, in which case Shaw was to read off the bearing from a scale and immediately 'wind off' as otherwise the enemy might detect them! In the morning Dr. Varley departed with a list of bearings hopefully pinpointing any mobile radar that had been set up along the French coast. D Day was only a matter of weeks away. Everybody knew an invasion was imminent and during those preceding weeks Ventnor had plotted several mysterious large convoys of ships which went out from Portsmouth and Southampton and past the Nab and the Needles travelling in such close order as to be a solid blur on the Radar screens. Half way across the Channel they sailed but then always turned back. These were considered to be mere feints to mislead the enemy as everybody expected the invasion attempt to be further east near Calais. But on D day itself Shaw remembers the excitement when the convoy went out and didn't turn back...it split into a solid Y formation and kept going....heading for those famous beaches. Whilst Shaw was at Ventnor, despite having had no show biz experience whatsoever, he became involved in a minor way with the RAF amateur dramatics group on the station. Started by Pat Carey an ex-producer from the Gate Theatre, Dublin, it was simply to help the lads and lasses occupy their off duty time but was to have a dramatic effect on Shaw Taylor's future. In the Autumn of 1944 he was posted to the Far East in the move to drive the Japanese out of Burma. RAF ELW (early light warning) radar sets moved down the road with the front line troops and this is mentioned in the Latham & Stobbs book. After VJ day their work was done and Shaw, now an LAC, was posted to Ceylon (Sri Lanka) to become a teleprinter operator : having been taught to type at his Council school made him a natural for this. However, there was little work to be done and his CO, whose wife had trained as an actress at RADA, proposed she put on amateur entertainments to boost the morale of his more or less idle troops. And written in Shaw's documents by a clerk at Ventnor was the word 'THEATRICAL'. Despite his protestation that he wasn't an actor, he was co-opted, indeed commanded, to play the lead in Arsenic & Old Lace, where his character had to kiss the leading lady.....the CO's wife! So while he had to restrict the passion despite being enthusiastically encouraged to by the raucous audience to do otherwise, his success was assured. The 'acting bug' had bitten. The group of thespian erks at Ventnor had all agreed to meet up there after the war. They did just that... forming a small touring company called The Gateway Players based where else but in Ventnor. On his return from the Far East and demob Shaw was invited to join them as driver, electrician and handyman. Then they went out 'on the road' - the Island roads and in those pre-television days were able to earn a modest but sufficient living. 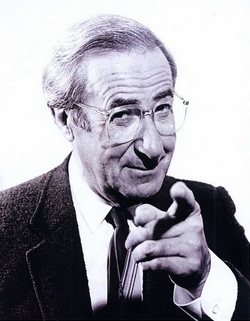 Shaw duly progressed from walk-on parts via two-liners to become a leading man. Jane, a lass from Scotland joined the company as a leading lady and in due course she became Shaw's wife. Together they continued their work in London and were able to find sufficient regular engagements to provide a much more comfortable living. Eventually Shaw won a scholarship to go to RADA and there his Hackney accent was eliminated. This was a professional advantage as he was then better equipped when he applied to work as a locum announcer in the newly formed Independent Television company, ATV. And that was the start of a long and versatile career, triggered entirely by his RAF Ventnor posting. . I always hoped that the pleasant hour spent with Shaw in his comfortable sitting room would trigger more anecdotes of his Ventnor days, which would supplement those already here, this being for two reasons, firstly that it is a part of his life that as yet I have not found to be widely recorded, and secondly that an especially high value is placed on the trusted first hand deposition from such a well known personality. However that was not to be : Shaw died aged ninety on the eighteenth of March 2015. I wonder if anybody watched him go? Read this to see what I mean.